Bohol is new Local Government Integrity Circle (LoGIC) destination after Gov. 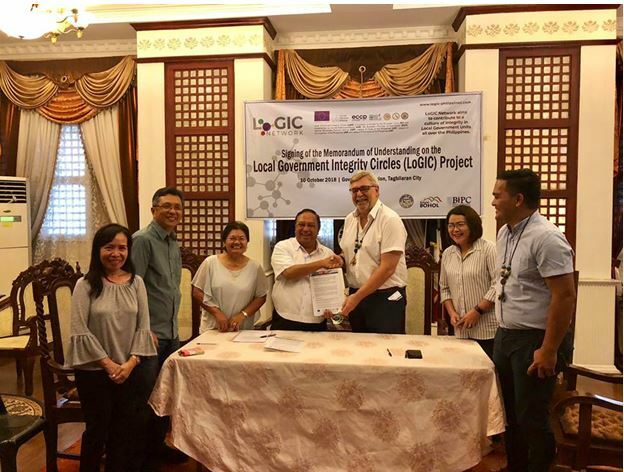 Edgar Chatto and Local Government Integrity Circles (LoGIC) Project country representative Stefan Maria Jost led signing of memorandum of understanding for the LoGIC project in Bohol on Wednesday. The project enlists multi sectoral participation to ensure government efficiency and good governance and to facilitate ease of doing business and local competitiveness through strategies and mechanisms that promote integrity. The governor expressed excitement for the partnership as Bohol governance has been a practice of shared leadership, from which various successes in governance have stemmed from, most recently becoming Most Business Friendly Province in the country, a distinct example of values that the LoGIC program upholds. The project aims to be able to create these integrity circles in 300 LGUs nationwide. Bohol is their 5th LoGIC Network destination following Negros Occidental, North Cotabato, Palawan, and Surigao Del Norte. Jost congratulated Bohol on governance and leadership of Chatto guided by vision and sustainability as has been evident in forums with government, the private sector and civil society. In his remarks, Jost mentioned leadership that is forward-looking and an end view of sustainable development as essentials in governance. He likened the LoGIC initiative as well as Bohol governance programs to the act of planting trees, in which when one plants a tree, they will never be able to sit in the shadow of the tree; but perhaps their children can. Bohol Association of Hotels Resorts and Restaurants (BAHRR) representative Mayet Gasatan stated full support of the sector for the partnership as in many other collaborative platforms that Bohol is engaged with. Civil Society and Bohol Non-Government Organizations Association head Emmy Roslinda shared LoGIC training experience with Bohol Investment Promotions Center (BIPC) chief Ma. Fe Dominise where she saw LoGIC as an affirmation of what Bohol has been successfully engaged in as far multi sectoral collaboration. The Bohol Chamber of Commerce and Industry (BCCI) through its president Engr. Albert Uy also vouched for Chatto’s leadership that is participative and consultative, with sectors invited to take part in governance and given a hand in decision-making.